Good location to enjoy this beautiful natural park. Midway between Cordoba and Granada, in the heart of Andalucia, the tiny white village of Zuheros sits high on the northern border of the Sierra Subbetica - a beautiful range of hills and National Park. The area is a dramatic limestone massif, weathered over millennia into a series of valleys and peaks, making it fantastic walking country. The walks are all in or around the National Park on farm tracks, country paths and along the 'Via Verde', a panoramic disused railway line, once used to transport the olive harvest. Views open out to river valleys, tumbling waterfalls and olive groves against the backdrop of mountain sierras and hillsides sprinkled with red peonies and orchids. Routes take you to the tiny villages of Zagrilla Alta and Luque with their quince orchards and castle, and the stunning cave above Zuheros where Roman and Bronze age remains have been discovered. Staying in such a small village guarantees genuine Spanish hospitality. The whitewashed 2-star Hotel Zuhayra, with its popular bar and patio restaurant, is a stone's throw from the Moorish castle and town square. There is a small pool for a refreshing dip after a day's walking. Your host, English-speaking Antonio, will be on hand with advice on how to organise your week. He will help arrange taxi transfers (included) where necessary from some of the walks, and tell you all about Zuheros' museums and other villages in the area. And for 'days off' or extra nights, the classic cities of Cordoba and Granada are less than an hour away by taxi. This holiday has walking on farm tracks, narrow paths and over green countryside. There are great views but no dizzy heights. Walking boots are essential. As some of the walking paths are poorly defined, we also provide GPS files (.gpx) for this holiday. Arrive at your hotel in Zuheros. A path climbs gently through almond trees above Zuheros before descending into the spectacular gorge of the Rio Bailon, then with golden eagles soaring above, you reach Cerro de Bramadero hilltop where you can relax under holm oaks enjoying wonderful valley views. You return past walnut trees and ancient wells on the way to the verdant river gorge that leads back into Zuheros. We take you to the C14 whitewashed hilltop chapel of Virgen de la Sierra - at 1216m it deserves its nickname 'The Balcony of Andalucia!'. You descend to valleys sprinkled with white narcissi, yellow daffodils and red peonies. Then after lunch by a sparkling waterfall hidden in the valley side, the trail returns under limestone cliffs and past huge holm oaks to Zuheros in time for a cold drink in the village square. You could have a relaxing day in Zuheros, visiting the Archaeological museum and Museum of Arts and Local Customs or head further afield taking a taxi to Cordoba (Antonio will happily arrange) and spend the day exploring the fabulous Cathedral, palace and Mezquita, sparkling like jewels in the Moorish crown. You may meet olivareros (olive farmers), with their mules this morning, diligently tending their olive trees on the hills above Zuheros, as you make the gradual ascent to Monte Abrevia (1129m), for lunch. Here you'll enjoy the best views of the week. A thyme scented descent affords perfect views of Zuheros as you approach the village along the Via Verde. Look out for protected griffon vultures soaring high above you today as you pass through remote Spanish cortijos (farms) in beech and oak shrouded valleys and enjoy stunning views east towards Sierra de la Pandera - the next range of hills. Before long the olive orchards of Zagrilla Alta are visible below, and when you arrive you can enjoy a cold drink by the natural spring in the village before we meet you and take you back to Zuheros. This morning sees you striding out east along the 'Via Verde' passing whitewashed farms and olive groves. A short climb brings you to Luque with its imposing castle and elegant square - a good lunch stop. Then up into the National Park - stunning views - before winding down through wild herbs as you descend towards Zuheros. The typically Andaluz Hotel Zuhayra is the perfect base from which to explore the Sierra Subbetica and the surrounding villages. The homely country atmosphere is immediately apparent in the beamed wooden bar. The clean white washed rooms are all ensuite and have tiled floors, wooden furniture and shuttered windows giving views over tiled rooftops to olive groves in the valley beyond. This modern 3* hotel is situated in an ideal position, just 200 metres from the Cathedral and a 2-minute walk from the Plaza Mariana Pineda, the location of the municipal tourist office. The hotel itself offers 53 modern and well-equipped rooms with a few traditional touches. The Molina Lario is perfectly situated in the old town just a stone's throw from the Cathedral, known as 'the one armed lady', and within easy walking distance of the other key sights. The recently built hotel is formed of one new building merged with 2 19th Century buildings, retaining their original facade. 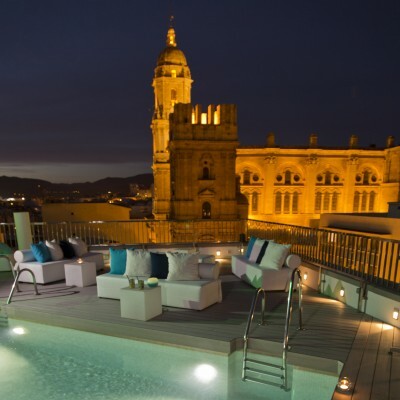 The rooftop pool and bar is perfect for relaxing after a days sightseeing, with views over the city and harbour. The 103 rooms exude comfort and tranquillity, with robes, slippers and a pillow menu to ensure you have a good night's sleep. Tea and coffee making facilities and complimentary mineral water are available in all rooms. Breakfast is a hot and cold buffet which can be taken in the central courtyard. The 4-star Hotel Becquer is a lovely hotel, with lots of original features, and is just a 10-minute walk from the historic old quarter and cathedral. There is a large airy lounge with plenty of seating, a breakfast room and attached tapas bar. The rooftop pool is open from 1st June to 31st October. Transfers included from Malaga airport at 11:00, and back to Malaga airport at 07:30. A great holiday - excellent planning and support and a wonderful location which combined beautiful countryside, a rustic rural Spanish locale and very enjoyable walking. The Hotel Zuhayra is brilliantly situated to explore both the white town of Zuheros and the mountains that provide the backdrop. The walk via Luque was excellent and we also enjoyed the easy choice of the Via Verde, walking on a disused railway line (a great option for cyclists too with well over 100km of level routes available). We were amazed that it was a Rural 2-star Hotel and wondered how much better it could have been had it been 3 or 4-star. As such it was excellent value for money [the food was at times, a bit disappointing and the choice was occasionally limited or there was no choice]. Beautiful situation, friendly staff and great food, with access to some lovely walks - similar to walking in the Lake District so bear in mind the effect of the heat! Lovely hotel with super friendly and helpful staff, especially Antonio the manager. Good food and the picnics are very good - a very large sandwich, 2 pieces of fruit, juice and water. You wont go hungry! The walks are great and we did them in the order that was recommended in the walking notes. If you want a day off from walking a day trip to Cordoba is well worth it. All the logistics went according to plan and we had an excellent holiday. Zuheros is a lovely, very quiet village in the Andalucian hills. The villagers offer a friendly "Buena Día" when you pass them in the street. The hotel Zuhayra offers friendly and helpful service. The two weekest points were 1) - The arrangements with B.A. Both the Outgoing and Return journeys failed to allocate adjacent seats and the initial lack of a Boarding or Check-In document for the Return journey did cause us some concern. and 2) Details for the suggested walks for 5 days were quite difficult to follow. Wonderful tranquil location and excellent helpful staff at the hotel. Walking notes provided are very out of date however and we would recommend using the hotel walking notes instead which are very detailed. Quiet location, offering a variety of challenging walks. Abundance of wild flowers and birds (in April). Excellent hotel, very welcoming and brilliant choice of good local food. Friendly and helpful staff, especially the taxi service. The Sierras Subbeticas was a lovely verdant limestone area to explore in depth using the excellent Hotel Zuhayra as a base. By the end of the week we had criss crossed it in various ways but without unduly repeating any area. We were made very welcome and comfortable by the hotel staff, taxi drivers and locals. The walking was very pleasant, despite the unseasonally high temperatures, with wonderful mountain views and plenty of wildlife interest. I would not advise some of the more remote walks to people who are not experienced hill walkers with good navigational skills. Owing to the lack of large scale, high quality mapping for Spain there were a couple of places where we were unable to find waymarks and strayed off the intended route (and hence needed to resort to GPS for assistance). A number of earlier guests made comments about this in the hotel log. Despite that we had a wonderful holiday and we hope to return in a later Spring season to enjoy the mountain flowers. Thank you for taking the time to write in with your post-holiday feedback. Firstly, we were pleased to read you had an enjoyable holiday overall and found the Hotel staff and transportation providers welcoming. We have passed on your comments. We were however sorry to read you encountered difficulties with some of the way marking. Please let me reassure you, we do review all of our route notes seasonally, however, we do realise areas can change during the season due to weather conditions, construction and route updates. With this in mind, we will review all of the feedback received in this area and updates made as required.. Thank you for bringing this feedback to our attention, as it allows us the opportunity to continue to improve our holidays for future customers. This was our third visit to Zuheros. The hotel is an excellent base for a walking holiday and the walks are challenging enough to feel that something has been achieved. We enjoyed a wonderful week's walking which exceeded our expectations. The landscapes, birds and flowers were exceptional and we particularly enjoyed hearing the nightingales singing in the gorge. We were very lucky to be able to see some of the Easter celebrations too. The hotel was very welcoming and offered excellent service and delicious food. Beautiful walking in unspoilt limestone scenery. Fantastic bird walching opportunities. Comfortable hotel with hearty picnics and interesting evening meals. Antonio ensures that all aspects of a Headwater holiday are arranged with great efficiency. This was the first week of the season and it was cold for three days. The hotel bedroom had heating but the bathroom did not. The communal areas of the hotel were cold. Obviously accommodation in this area is designed to keep heat out. If the weather is not good there are limited opportunities here. especially as the local museum was shut for refurbishment for the whole season. The hotel staff were very helpful and friendly. We found the walks quite challenging, the directions were mostly good but on one occasion (the end of the Ermita walk) the alternative route back to the hotel was impossible to find. The path was completely invisible and we had to walk back along the road. The scenery, birdlife and wild flowers were wonderful. We hired bikes from the hotel one day and cycled along the Via Verde (disused railway track) which was easy cycling with interesting views. Another day we took the bus to Cordoba which was cheap, reliable and well worth while. We enjoyed this holiday but felt that overall both the hotel and the village were not places to be If the sun isn't shining. A fantastic location with plenty of variety in the walks. If you want a break from walking there are opportunities to visit to local towns/villages, or to relax at the hotel. Be prepared to deal with high temperatures, even in September! We were very pleased with the walking routes and overall package, plus interesting days out in Cordoba and Malaga. The hotel in Zuheros was slightly 'simpler' than we'd normally choose but they worked so hard to provide excellent service; taxi was great too. A well planned holiday in an area we would not have discovered apart from through your brochure - we rate Headwater highly. We had a wonderful weeks walking, the hotel was in a lovely hill top village. The walking was good in wonderful scenery with beautiful wild flowers and birdsong.Antonio and his staff looked after us really well and we also enjoyed our day trip to Córdoba. This was our twelfth trip with yourselves and one of the best. I could not fault the hotel staff, who were all very friendly and extremely helpful. The walks were beautiful and April proved a lovely time of year with all the spring flowers. A most enjoyable holiday - the organisation and transfers worked well and the hotel was a 'gem', friendly and relaxing and with helpful staff. The walking notes were easy to follow although care was needed on some paths where stony. Overall splendid walks in beautiful scenery with many spring flowers. Outstanding walking area. Thoroughly enjoyable. The team at the hotel couldn't do enough to help. A decent range of walks nothing too strenuous but just right in the unseasonably high temperatures. Cordoba was a stunning place to visit so would strongly recommend this on the free day. We enjoyed having the extra days in Granada as a counterfoil to the tranquility of Zuheros. A delightful area, away from the usual tourist spots. An attractive, friendly hotel and village. Varied walks with lovely long-distance views. Care needed on the stony tracks and paths after a prolonged period of dry weather. Excellent holiday; very interesting area of Spain to visit. The walks were varied with spectacular scenery. The hotel was well located and there was often something going on in the town square in the evening. Hotel staff friendly and helpful and the food was very good. I know the Spanish eat late but the 8.30pm evening meal was the only downside particularly when we wanted to have an early breakfast so we could start walking before it got too hot. Since Headwater clients have their own menu maybe an earlier sitting could be considered. From the first contact with Headwater until we left our Hotel the service was excellent. The Hotel was small, comfortable and the staff very friendly. The walking notes were fantastic, and the walks took in some most wonderful scenery. Cannot fault the holiday at all. Thank you. Well-chosen walks in a scenic area with classic limestone features. Can be rocky and stony underfoot in places, but all walks within Grade 2 definition. Arrangements at Hotel Zuhayra are excellent; Antonio was always helpful and the staff went out of their way to provide good, friendly service. A really excellent week - well organised and planned, allowing us to concentrate on the splendid walks. I hadn't been on an organised walking holiday before, but I will certainly try some more of these trips in future, since they allow you to get to places that you might not try on your own. My fourth Headwater walking holiday but the first based in one place. Loved the small, friendly hotel, and the flexibility to chose our walks according to mood, weather and stamina. Also the chance to take day trips to Cordoba and Granada. Excellent holiday with good and varied walks and lots of interesting limestone scenery. Hotel was a welcoming base with friendly helpful staff and lovely food. All aspects of booking and organisation went without hitch. Taxi arrangements and driver were again excellent! This was our second visit to Zuheros. The Hotel Zuhayra is the perfect base for a walking holiday. All the staff are friendly and helpful and the evening meals provide a wide range of well-cooked local food. The walks are challenging enough to feel that something has been achieved at the end of the day. Hidden Valleys of Cordoba: a week at the charming Hotel Zuhayra in the pretty white mountain village of Zuheros in mid-May was all that six 70 somethings could wish for. Headwater certainly have a hit on their hands here. Very attentive, helpful staff, good regional food and wine, excellent, if strenuous in parts, walking and wonderful scenery. We added on two nights in Granada at the comfortable, centrally situated Hotel Dauro II from where it was an easy coach ride back to Malaga airport. Headwater's arrangements for our travel and stay were excellent. Exhilarating walks in magnificent mountainous landscape with dramatic views; hotel a 'home from home' in authentic village Spain looked after by genuinely kind and courteous staff; vegetarian food was outstanding here with a careful choice offered for each evening (a first on the continent!). Local driver was punctual, good driver and always cheerful. Local people were a really significant part of making this holiday so enjoyable. There was sufficient of historical and architectural interest locally, from neolithic caves to nineteenth century railway history, to interest us without needing to go elsewhere. An 'independent' Headwater Holiday can be adjusted to suit individual capacity, especially as one grows older! We wanted to go to this particular area but no longer operate at two boot level. So we used the notes, Antonio's advice and good public transport services to visit Cordoba and Granada, to tweak the holiday, enjoy the Subbetica National Park fully as well as two historic cities. and the food was superb with choices which always included at least 1 vegetarian option for my husband. A holiday which was thoroughly enjoyed. and can be recommended without qualms. Selected Saturdays from 27th Apr 2019 to 26th Oct 2019, for 7 nights. All dates are subject to availability, please contact us to check. This holiday could also be done with the use of a hire car. Though not essential for the walking days a car is useful for day trips to Cordoba or Granada, although taxis can be organised to visit these cities. Due to the tailor-made nature of our holidays, we need a little more information in order for us to check availability for Hidden Valleys of Cordoba Walk. Simply complete the form below and a member of our sales team will contact you (when it's most convenient for you) to provide availability information, travel options and an accurate price. Of course there's no obligation, but if you do wish to proceed with a booking they will be on-hand to assist you throughout the process.